Lithuania is a small country on the Baltic Sea with a population of around three and a half million. While it hasn’t been as popular as a tourist destination as its fellow Baltic nations, Latvia and Estonia, many who have been to all three Baltic countries have a soft spot for Lithuania in particular. 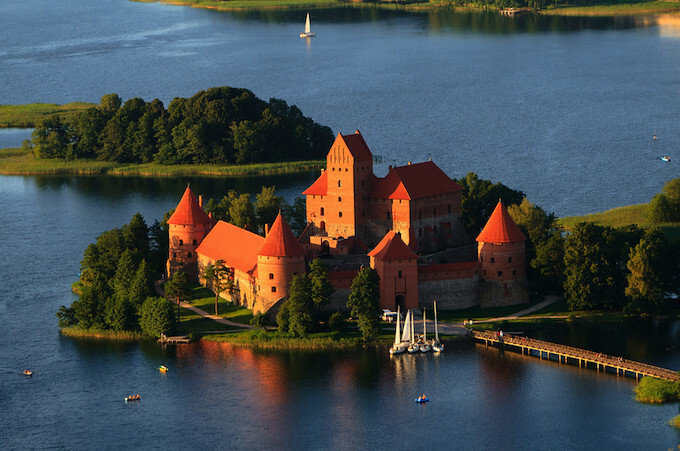 From the charming medieval old town of Vilnius to the majestic castle on the lakes at Trakai, Lithuania, at the right time of the year, can be a wonderful place to visit. Lithuania became a member of the European Union in 2004. The official language is Lithuanian, one of only two surviving members of the Baltic language group (the other being Latvian). English is quite widely spoken in more touristy areas, however Russian and Polish are also very common in many parts of the country. The best time of year to visit Lithuania is any time between May and late September. Summers can be quite hot, especially in Vilnius and other inland locations, but the summer months have a wonderful charm about them thanks to the generally reliable weather and the vibrant café culture. For most people, Lithuania should be avoided during the winter months and during the big thaw that typically occurs in late March. Winters in Lithuania are usually bitterly cold with temperatures sometimes dropping to -20 and lower, and snow covering the entire country for several weeks to a couple of months. Vilnius, Lithuania's charming capital city, is by far the most popular destination in the country. It's a small and manageable city which is easily navigable by foot. There are plenty of charming, rustic side-streets and parks to stroll through when the weather is good. The Town Hall Square, Cathedral Square and Gedemino Avenue are truly beautiful areas of town. neo-classical structure right in the centre and, behind it, the Royal Palace, demolished in 1801, has recently been reconstructed. Leading down from there is Gedemino Prospektas, Vilnius's stunning main avenue lined with upmarket hotels, shops and restaurants. No other town in Lithuania offers as much to tourists as Vilnius does, although Kaunas and Klaipeda, Lithuania's second and third cities both have charming old towns. Klaipeda, Lithuania's port city, is also a short ferry ride away from the beautiful dunes of the Curonian Spit. The Spit, known for it’s fine sandy beaches and pristine landscape, is a giant sand dune that separates the Baltic Sea and the Curonian Lagoon. The 100 km long peninsula stretches from the Kaliningrad region, all the way to the town of Klaipeda. Lithuania's famous pilgrimage site, the Hill of Crosses is also worth the visit. It's a two-hour drive from Vilnius, located just outside the city of Siauliai, in northern Lithuania. The shrine boasts a small hill, covered with a whopping number of about 100.000 crosses, brought here by Catholic pilgrims, over the course of two hundred years. The most popular day trip destination from Vilnius is Trakai, a charming town on the lake, about half an hour away by bus from the city. Here, visitors can explore the small island castle or take boat rides and swim in the surrounding lakes, while in the winter months, visitors can get to the castle by walking across the frozen lake even. Lithuania, until recently, was one of the more difficult places to get to cheaply. Since joining the European Union, however, regular cheap flights now serve both Vilnius and Kaunas, although most of them are from London Stansted. There are many international busses going to Vilnius or passing through the city. International trains are rare and within Lithuania itself, the most common way to get around is to travel by bus. Local transport within Vilnius itself is cheap and fairly reliable, although, there is rarely any need to catch public transport within the city itself, since almost all of the tourist sites and hotels are within walking distance of each other. Lithuanian food is typically fairly heavy and meat oriented, with some of the most popular ingredients being potatoes, cabbage, pork, sour cream and dill. It is typically affordable and there are plenty of pubs and restaurants to choose from. Some of the most typical Lithuanian dishes include Cepelinai (heavy potato dumplings stuffed with meat and served with sour cream and bacon bits) and Saltibarsciai (cold beetroot soup). Besides the local flavors, the country also offers a vast number of good quality Italian restaurants, Steakhouses and Belgian pub fare. When it comes to alcohol, one of the traditional favourites of the country has long been vodka, which in Lithuanian, is called "degtine". Krupnikas, a thick honey-based spirit is also popular. For light alcohol, beer is the favourite drink and Lithuania produces some world-class beers such as Kalnapilis, Svyturys and Utenos. Wine is becoming more common, with many bars being rebranded as "wine bars", although wine is typically expensive or of questionable quality. If you want to try a typical soft-drink from the region, try gira, a refreshing fizzy drink made from black bread.